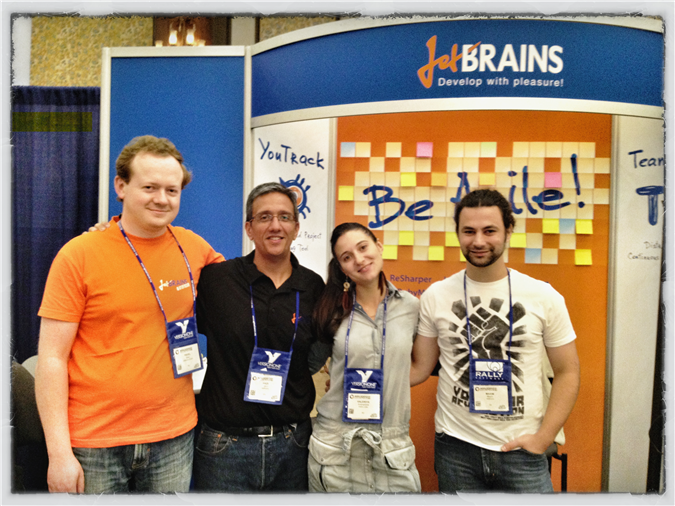 The JetBrains team is now back from Agile 2012, Dallas, Texas, inspired by the awesome Agile talks and those of you who not only visited Agile 2012 but stopped at the JetBrains booth to chat with us. It’s always great to discuss fresh trends, share ideas and t-shirts with both Agile experts and those new to the methodology. Thank you for your time and feedback! Full of new impressions and thoughts, we’re eager to implement them in our products to make them even more Agile for you. And that’s not it: we’re going to make a pleasant surprise to those who gave us their contacts at our booth. We won’t reveal the secret now, but be ready to get some good news from JetBrains soon! Swing by our booth if you go to these events, and let’s share! This entry was posted in events, news and tagged Agile, conference. Bookmark the permalink.